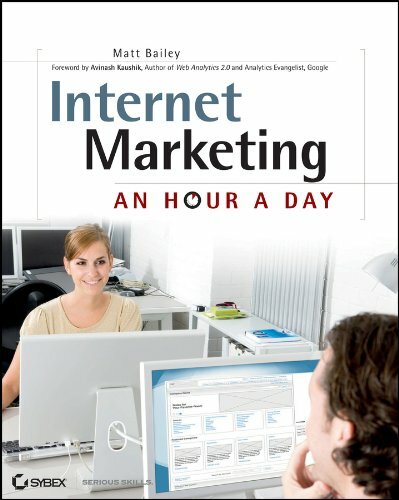 [PDF] Internet Marketing: An Hour a Day | Free eBooks Download - EBOOKEE! Description: Proven, task-based approach to developing winning internet marketing campaigns If you've been seeking a practical, day-by-day, do-it-yourself plan for success in your Internet marketing, this is the book for you. The latest in the very popular Hour a Day series, this book gives you step-by-step instruction and clear action plans for all crucial aspects of successful internet marketing: SEO, website optimization, integration of social media and blogs, and pay-per-click strategies. Above all, it shows you how to use analytics effectively, so you can track and understand your results, then course-correct as you need. Provides step-by-step instruction to help you design, implement, and measure an internet marketing strategy Uses the empowering and winning approach that has made the books in the Hour a Day series top sellers Breaks down intimidating topics into approachable, hour-a-day tasks Covers key topics in step-by-step detail, including SEO, website optimization and usability, analytics, blog integration, social media, and pay-per-click strategies Offers expert guidance from an experienced and well-known internet marketer, Matt Bailey Drive targeted traffic to your site, keep them there, and convert them into happy customers with this refreshingly practical, roll-up-your-sleeves guide! No comments for "[PDF] Internet Marketing: An Hour a Day".